Consider this photograph. Well, all right, consider this cropped digital scan of a lithographic copy of a photograph. What do you see? Nothing terribly unusual in the photographic conventions of mid-nineteenth century portraiture. A respectable-looking man in military uniform sits, half-turned towards the camera. This image is the reproduction of a medical photograph which appears in the Medical and Surgical History of the War of the Rebellion. (The “war of the rebellion” in the title is what we now call the American Civil War, 1861 – 1865) This text was a compilation of Union medical and surgical records from 1862 – 1866, compiled alongside pension records and specimens from the Army Medical Museum, which was also founded by the U.S. Surgeon General’s Office in 1862. It was published over several years about a decade after the war’s conclusion. 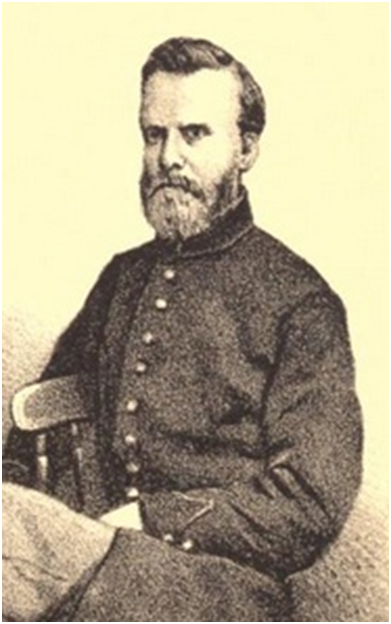 One of the men associated with the museum and archive, George Alexander Otis, was also one of the leading men responsible for the compilation of The Medical and Surgical History. There are six massive volumes of this text, which has been described as 55 pounds worth of information. I have seen them in person, in the Health Sciences library’s special collections room at the University of Alberta. They are chock full of statistical and textual data (which has been very much noticed and studied by medical historians), but also intriguing examples of visual culture: early medical photographs. In this example, we can see four different men who are meant to represent four “types” of ankle amputations. However, despite the clear expository and pedagogical purpose of the creation of these images, there is something more to it. There is a very clear link in the composition of these images to contemporary portraiture. Why is it that the photographer and the compiler of the text chose, time and time again, to depict the entirely of the body of these patients, instead of cropping around the “relevant” part, the injured leg? Why do we need to see the face when studying the ankle? Body parts were depicted in this text in isolation, but most of the time that was in the context of photographed scientific specimens: skull fragments, leg bones, etc. These body parts were usually from deceased men. If the body part was attached to a live person, they were usually, with some of exceptions, depicted in their entirety, especially if it was on a full page lithographic plate. I could only find a few of examples of images in which the upper body was pictured outside of the frame, usually as smaller drawings within the text itself. In the vast majority of cases, these men were not anonymous. These lithographs are accompanied by an embarrassment of information: name, rank, battle where injured, when injured, where they were sent, the treating surgeon, the steps of their recovery, whether they applied for/received a pension… even bowel movements are described. These men are not anonymous. Why are these men depicted in “portrait style” medical images? These are a few possible answers. Any, all, or none of them could be true. 1) Photographs were often perceived in the nineteenth century as being neutral gazes, free from subjectivity (science’s old enemy!). They were simple mechanical reproductions of “reality” as it stood before the lens. Therefore, photography is ideal for scientific purposes like this one. However, it was the early days of photography yet. Perhaps this was simple the “normal” photographic convention: how one photographed the human body. Just as common photographic portraiture took its “artistic” cues from painted portraiture, so did medical images take their cues from photographic portraits. 2) There were advantages to viewing the entirety of the patient. For example, one can see potential expressions of pain in the face. The look of the injured limb can be compared with that of the healthy one. One can also see if the injured limb if the limb can support the person’s weight, if the subject is standing and received an injury below the waist, or if an injured arm needs to be rested on the back of a chair because it cannot hold itself up. 3) Perhaps the composition of these images is not a matter dictated by photographic convention, but medical practice at the time. The Civil War marked the last gasps of the humor theory of disease in which the body must remain in constant balance through purging, bleeding, depletion/excretion, etc. In fact, bleeding had been firmly rejected only at the very beginning of the war. Nevertheless, as in the late antebellum period, many doctors continued to view their patient’s health holistically, a holdover from this idea of the body’s humors being out of balance. Thus, it makes sense to depict the entire body, because what can you learn from one part of a whole? 4) Potential respect for the dignity of veterans. Other medical images contemporary to this set, including photographs from France in the 1850s of psychiatric patients and exceptional medical cases (such as crazily bent spines or terrifying facial tumors), were depicted with far less dignifying aspects, and the patients were often made anonymous or synonymous with their conditions. One author describes the photographs serving to make the subject into object. That is not what is occurring in these American images from the Medical and Surgical History. Once again, these men were not anonymous and were not treated synonymously with their injuries. Immediately after the war, many amputees were viewed with respect by the American public: their empty sleeves were testament to the ultimate bodily portrayal of their patriotic sacrifice. The veteran was celebrated in poetry, song, and other discourse (though this idealization may have done little to actually help them economically). Nevertheless, this lack of anonymity and fairly dignified portrayal of these men as individuals may be a reflection of the respect afforded to veterans of the victorious North, as compared with the portrayals of French psychiatric patients. It may also explain the conspicuous lack of photographic portrayal of any of the injured from the 180,000 strong African American contingents of the Union army (or, rather: in my perusal of two of the six volumes I could not spot any). Medical imaging really highlights the tensions between photography’s uses in “artistic” genres, such as portraiture, and “objective”, “scientific” ones. Drawing a hard and fast line between examples of “art” and “science” are not as straightforward as many would think. These thoughts were originally shown to the wider world (or, at least, at Carleton University) at the Underhill Graduate Student’s Colloquium on March 7th, 2013. A seminar paper will soon follow. If this is something that interests you (as it interests me!) please don’t hesitate to message me. If you have any other intriguing examples from the early days of photography, particularly medical imaging, please share it with the rest of the class. Dammann, Gordon E. and Alfred Jay Bollet. Images of Civil War Medicine: A Photographic History. New York: Demos Medical Publishing, LLC., 2008. Figg, Laurann and Jane Farrell-Beck. 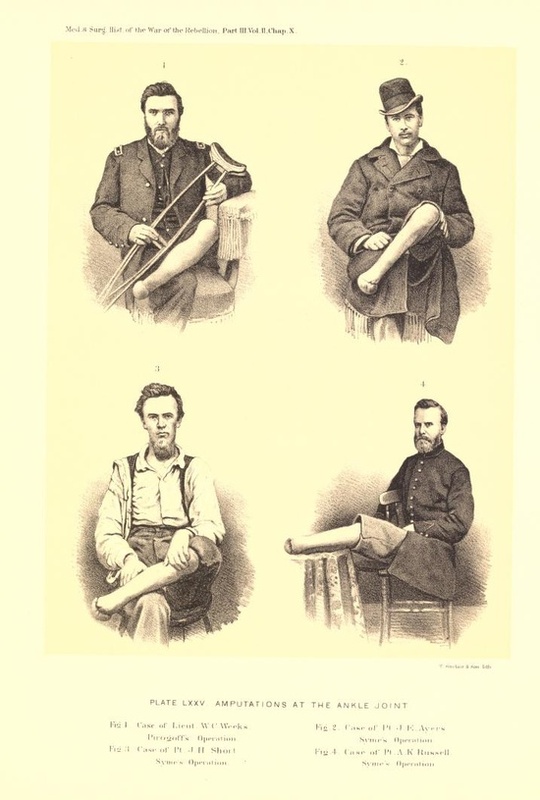 “Amputation in the Civil War: Physical and Social Dimensions.” Journal of the History of Medicine & Allied Sciences Vol. 48 Issue 4 (October 1993): 454-475. O’Connor, Erin. “Camera Medica: Towards a Morbid History of Photography.” History of Photography. Vol. 23, Number 3 (Autumn 1999): 232-244. Otis, George Alexander and J.J. Woodward. Reports on the extent and nature of the materials available for the preparation of a medical and surgical history of the rebellion. Philadelphia: J.B. Lippincott & Co., 1865. Trachtenberg, Alan. Reading American Photographs: Images as History, Mathew Brady to Walker Evans. New York: Hill and Wang, 1999. Wells, Liz, Ed. Photography: A Critical Introduction. London and New York: Routledge, 2000. A few years back (which is the equivalent of centuries, in internet terms), I was shown this photograph by a friend of mine who knew I was interested in researching the American Civil War. The photo appears to show a group of seven (in reality, eight) men in what looks to be military uniforms. One man on the far left may be holding a baseball bat and ball. There is some kind of canvas screen or tent behind them. And, hidden on the far left of the frame… a face. The way it was explained to me (as I recall) was that it was the earliest known incident of “photobombing”. Now, for those not in the know (by which I mean the “uncool” ones in our midst), photobombing is the “art” of leaping into a photograph where you are unwanted, usually to the amusement of nobody but the photobomber. That being said, there can be a few hilarious exceptions, as seen in this photoset of photobombing celebrities. Photobombing, by definition, is a sneak attack, executed with utmost speed and, at times, discretion – many people don’t realize that their photos have been photobombed by someone in the background until (back in the day, because I am a historian) the photos had been developed or (today, because I am a hip and cool cat) uploaded onto facebook and mocked by one of your tens of thousands of facebook friends (10,000 is a normal number of friends to have on facebook, right?). You would think that photobombing would be impossible if, you know, the photobomber had to hang around for thirty seconds or so for the shot to be exposed. Right? Right. Apparently, as my vague memories of my friend’s story tells me, this photograph was taken during the American Civil War, when exposure times were commonly, what, at least 15 seconds, which is why as far as I know there are no photographs of the actual battles of the Civil War. The action would happen too fast to be recorded on film. The leadup and the aftermath of these battles were very often photographed, to gruesome effect. But I digress. My friend informed me that that man hiding under the bench on the bottom left is a man from a rival regiment. (How can we tell that? The shoulder pips? The hat?) Clearly(? ), this man snuck into the photograph by hiding under the bench, and thus managed to be photographed for posterity. Now, I am currently the teaching assistant for a second year American History survey course, so when the subject of Civil War photography came up, after I thought of the usual gruesome examples of Civil War photographs (and some not-so-typical but also gruesome images: more on those in a later post), my mind immediately went to this historical example of photobombing, because I quite like to hook my students with a quick historical comic or image to get them initially engaged in the discussion we were going to have that class. However, being the good little historian I am, I wanted to find the original source so we could discuss the image in detail. When I found it on my favourites list, it turns out I was linked to it from Retronaut.com. Not a problem. They often cite the source their images come from, even if it’s not written on the page in the description box. Except they didn’t this time. No other information, either, just the title: “19th Century Photobomb”. So I knew I’d have to go deeper. A few months back, via Twitter, I was linked to this blog post which drew my attention to a little-known Google search option: you can search not just by text but by image. Seriously. Check it out. It’s really neat, and can be very useful for people trying to find out more about an image. However, it’s not a perfect system. I managed to find quite a few other websites that showed this particular image, but when they cited their sources, they almost invariably led right back to the Retronaut page I’d begun with, or an eloquently-named website called i-am-bored.com which also had no further sources. 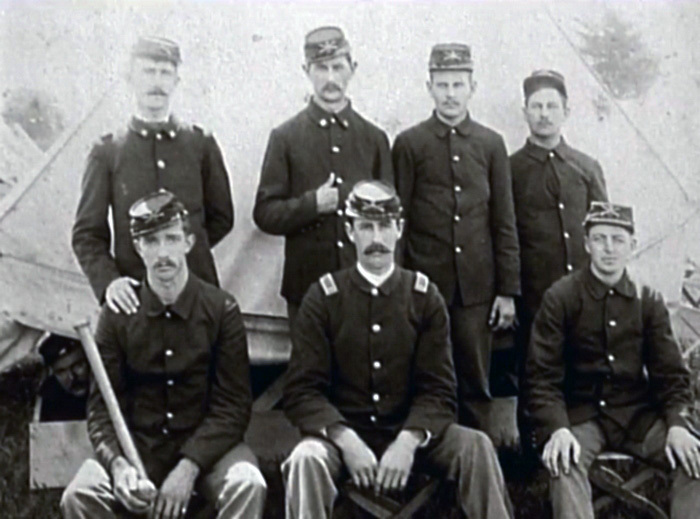 That one called it “One of the First Photobombs Ever: The Civil War,” but they don’t explain where they got that information either, despite apparently having enough spare time to be bored enough to post this picture. (You’d think with that much spare time on their hands they could put me out of my misery and write a bit more?) It looks like everyone else had just spotted it on either of these two pages and reblogged it without thinking anything more of it. But where did it come from? I honestly couldn’t tell you. And that bothers me more than I thought it would. I want to talk about it, I want to show it to people, to point to the humour in the story, the unique ways people in the past weren’t all that different from us today: we still have the same urge to sneak into photos where we’re not wanted, for instance. However, I don’t feel that I can keep repeating the story I was told without knowing more about what I’m looking at. Do I even know that this was taken during the Civil War? I’m not comfortable stating with certainty from the uniforms we see that these are even members of the American military. By itself, stripped of context, it is still a fascinating image, but I’m projecting my own impressions and thoughts upon the men pictured. So I didn’t show it to the students. I probably could have spoken about the same things I spoke of here, or even the reasons why we reblog photographs like this because of their aesthetic value or what we think they are, divorcing them from their original contextualizing explanations, if such explanations ever existed in the first place. Right now, I have this imaginary caption in my mind that accompanies this image. It would read something like “The [number] [State] Regiment, 1863, and an unwanted addition from the rival regiment, the [different number] [State].” However, I don’t want to contribute to the misinformation so common on the internet when it’s so easy to make yet another copy of the same picture and yet so apparently difficult to create a link back to the original source – if, again, such an original ever existed in the first place. Two or three years ago, while doing research on Civil War medicine at the University of Alberta, I ran across an interesting reference to a particular female doctor who served during the conflict on the Union side. Her name? Dr. Mary Walker. You might notice something intriguing about what she’s wearing. Namely, it doesn’t look anything like this or this, two examples of higher-class women’s fashion from the decade of the 1860s: the largest hoop skirts that would be tolerated (which evolved into bustles in the following decades) covered by more petticoats (it wouldn’t do to have the line of the hoops show), covered, finally, by the actual dress. That was a lot of fabric, none of which is evident in the above photograph. In fact, if you didn’t know any better, it looks like she’s wearing… men’s trousers underneath that short skirt. And you’d be right. Dr. Walker believed that tight corsets along with voluminous skirts and petticoats were unsanitary and hampered her medical practice. So she didn’t wear them: first sporting bloomers, then, midway through the war, abandoning those for a male surgeon’s uniform. She didn’t attempt to pass as a man; she was an obviously female doctor wearing a male uniform. 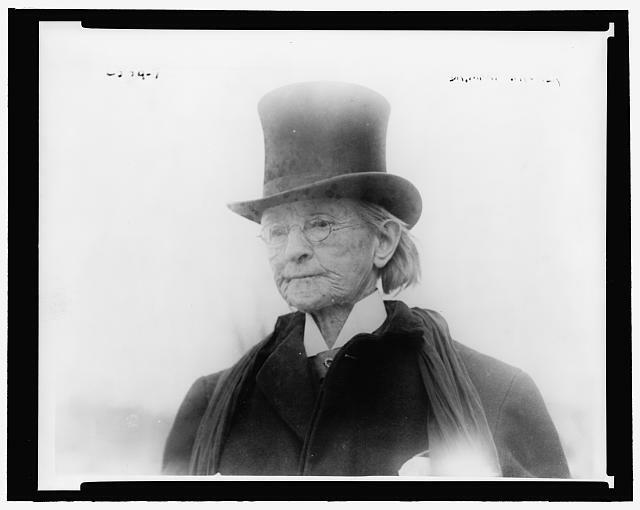 She continued to wear men’s clothing throughout her long life (she lived until 1919) and continually advocated for rational dress reform for women. 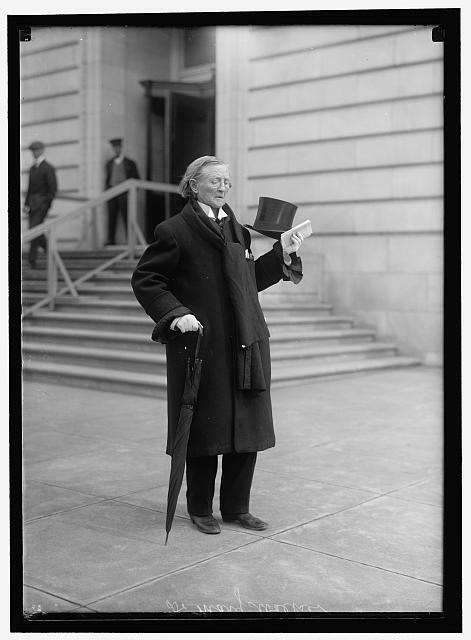 Here, she is pictured in a man’s top hat in her old age, circa 1911. 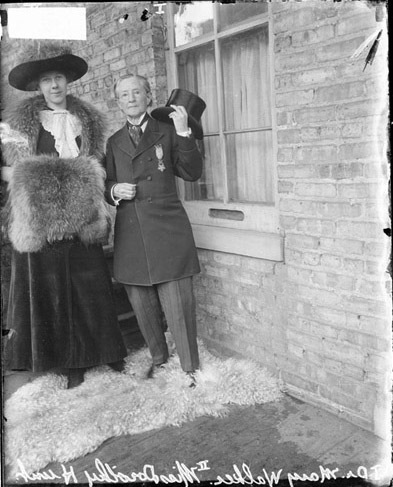 Here she is, pictured near the end of her life, wearing the infamous medal. Again, see how much women’s fashion has changed over the years, and how dapper and comfortable Dr. Walker looks in her old age. Leonard, Elizabeth D. Yankee Women: Gender Battles in the Civil War. New York: W.W. Norton, 1994. 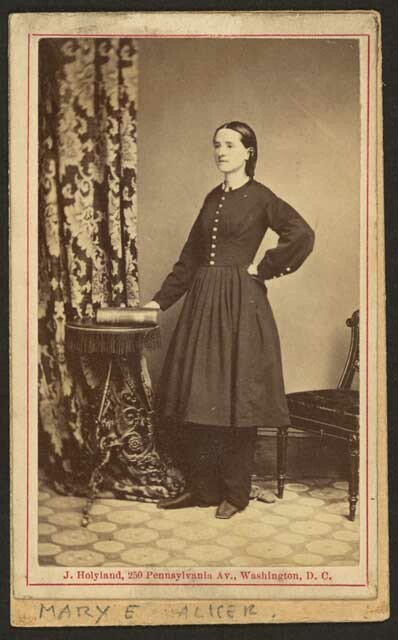 Schultz, Jane E. Women at the Front: Hospital Workers in Civil War America. Chapel Hill: The University of North Carolina Press, 2004.